Cleanliness is essential for working on miniature mechanical instruments. A sealed room with electrostatically filtered positive air flow provides a clean area for assembling the internal parts of gravity sensors and other mechanisms, such as precision levels. Low-lint clothing is worn by the meter builders. 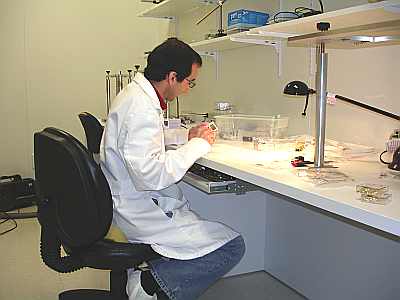 Facilities include specially constructed work stations designed to facilitate state-of-the-art assembly techniques. The clean room is entered from the pier room which serves as a catchment area for lint and dust. Stable piers are essential for reading and testing gravity meters. Special equipment includes a precision vacuum/pressure gauge for pressure testing meters, and equipment to backfill gravity meters with dry nitrogen. A precision tilt-table for calibrating levels and work areas for installation of “O” rings and other “semi-clean” processes are included. The pier room also serves as a preparation area for material entering the clean room. ZLS maintains a small but complete model shop. It has the capability to manufacture all the internal parts of gravity meters. The shop’s primary function is the development of prototype parts and systems. 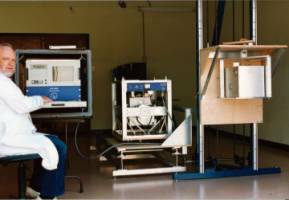 ZLS has constructed a complete facility for testing marine gravity meters. These machines are capable of generating all the motions (linear, circular, and ramp) required to test and adjust marine gravity meters. The tracks upon which the machines run are straight and parallel to better then 0.002 inches (0.051 mm) over approximately 48 inches (1.2m). 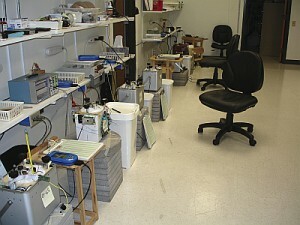 A small electronics lab provides a good environment for the development of electronic systems. Extensive use of surface-mount technology is made in the design of small embedded circuit boards. Although some assembly work is performed here, the main purpose of the lab is research and development projects.